Under a few Volts, water splits to form hydrogen or oxygen gas. and low-pressure pumping (since gas is compressible). EOF requires tens of volts, or greater. 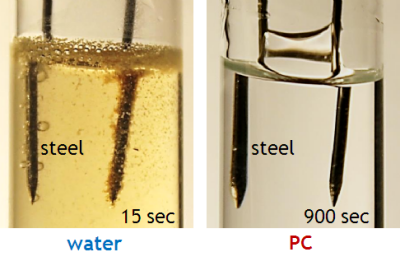 The molecular structure of propylene carbonate (PC) is shown here, and its key properties for EOF are compared to those of water in the table. Note the high dielectric constant. Flow rates are comparable to those of water, while response speeds are a bit faster and pressures are higher. 1. D. Sritharan, A. S. Chen, P. Aluthgama, B. Naved, and E. Smela, "Bubble-free electrokinetic flow with propylene carbonate," Electrophoresis (in press) (2015). Deepa Sritharan is now working on paper-based EOF devices, including afabrication method based on lamination.